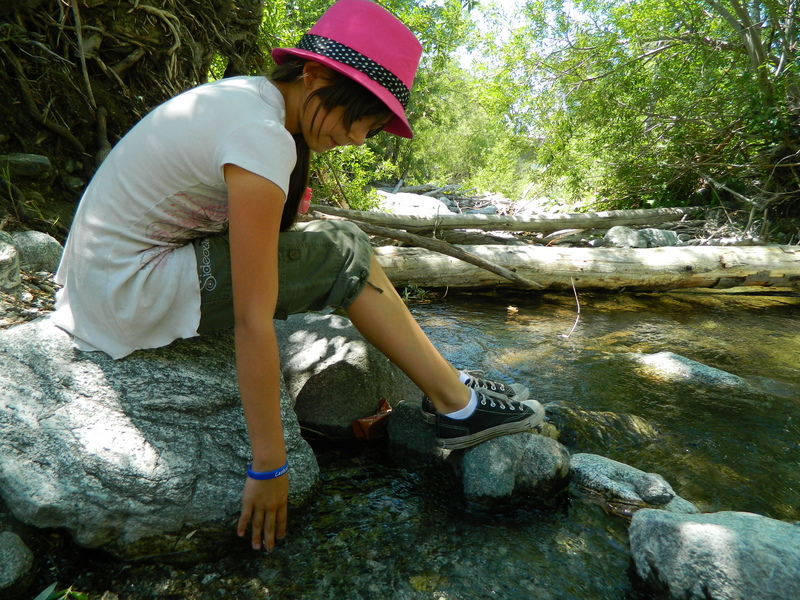 Emily tests out the ice cold water of San Antonio Creek at Mt. Baldy. If you’re looking for a quick way to escape rising temperatures, it’s tough to beat a day trip to Mt. Baldy. Have your kids “unplug” – there is no cell phone reception – and visit a different world from a simpler time. Easily accessible from the 210 Freeway (directions below), Mt. Baldy is where the Angeles National Forest meets the San Bernardino National Forest and it offers hiking trails, a cute village, a nature center, and a cool stream for hot summer days. 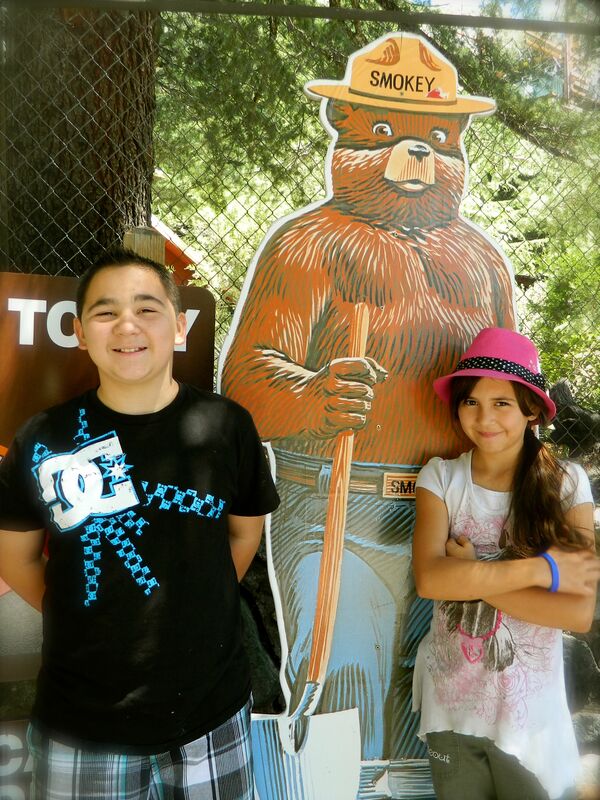 Hunter & Emily meet Smokey Bear at the U.S. Forest Service’s nature center at Mt. Baldy. 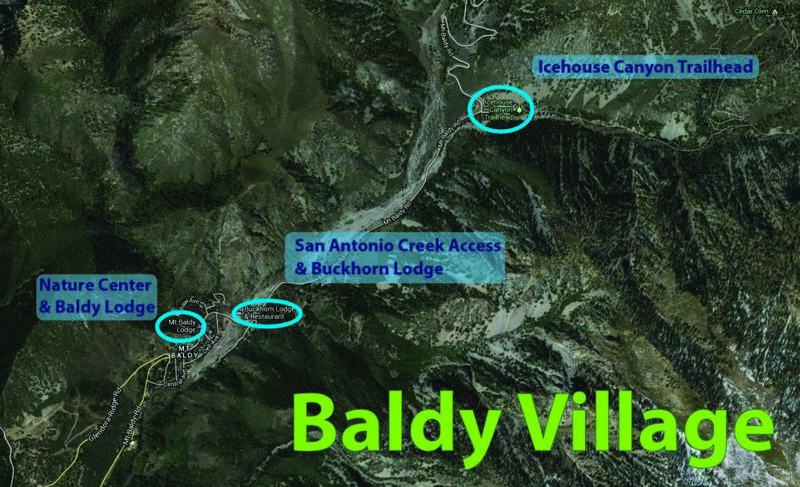 You need a parking pass to park anywhere outside Baldy Village, so your first stop should be to the Mt. Baldy Visitor Center to pick one up ($5 for the day, Season Passes available). The Visitor Center is located in the Village’s original 1920’s schoolhouse, directly across Mt. Baldy Road from the Baldy Lodge – a local watering hole. Arrive early to park outside next to the road. Parking in the Visitor Center’s lot is limited to 20 minutes (they want to avoid people parking there for day-long hikes). Inside the Visitor’s Center is a trail that shows you the flora and fauna to be found from the foothills to Mt. Baldy’s peak. Also on display are exhibits that show what life was like locally in the 1800s and early 1900s. Friendly rangers are on hand to help you pick out a hike that works best for you. They have maps of the different hikes available and mark them with your choices, along with directions on where to park. Outside in the nature center is a reproduction of a Native American (Tongva-Gabrielino) village and a mining camp. Emily and Hunter loved exploring the buildings and tents beneath the shade of grand old trees. Also, picnic tables and public toilets are available. Be sure to bring your own hand sanitizer, as there is no soap available. By far the most popular part of the day was playing in San Antonio Creek. Drive up Mt. Baldy Road, passing the Buckhorn Lodge on your left. As soon as you cross the bridge, pull in to the gravel parking area to your left. Follow the sounds of the water down to the San Antonio Creek. Beautiful trees shade the creek from the heat of the day and whisper as the wind blows through them. San Antonio Creek at Mt. Baldy is part of a vast network of headwaters that delivers water to millions of people living downstream. This area is where you can truly unplug and enjoy nature the way people have for centuries – by dipping your feet in the shallows of a cool stream. It is important to caution your kids to watch where they step – the rocks are slippery and there are spiders by the waters edge (this is nature, not a water park so it’s important to respect it and be aware of your surroundings). Hunter didn’t want to leave. Use commons sense when approaching the stream. If it looks too full or fast than simply enjoy it from the banks. However, when we got there it was shallow and slow enough to wade in. Emily and Hunter were reluctant at first to step in – it is COLD. The water comes from snowmelt. After a couple of minutes, though, they became absorbed with looking for bugs and splashing each other. In fact, when it was time to go I could barely pull them away. One thing that they were completely shocked to learn is that much of their drinking water actually comes from this stream and others like it in the area. 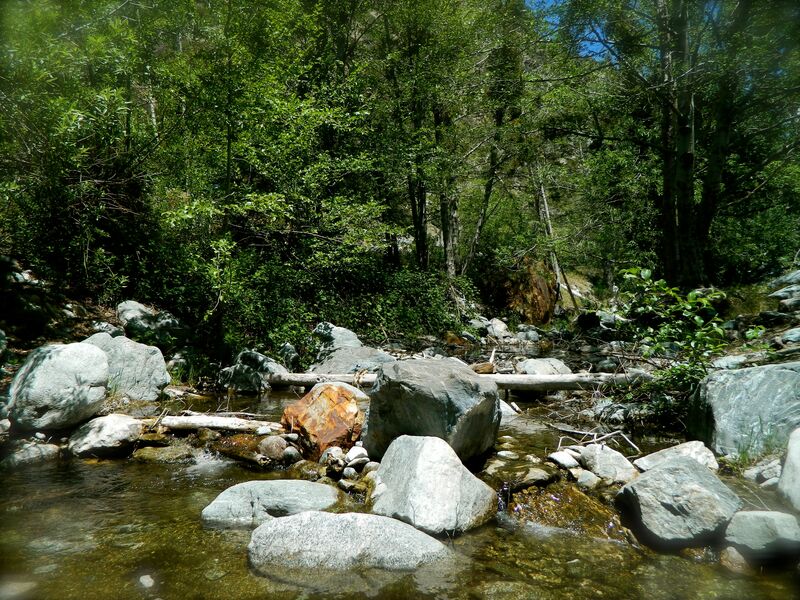 If you live in the Santa Ana River’s watershed, chances are most of your water comes from this stream as well – and it is thoroughly cleaned and rigorously tested for safety before reaching your tap. 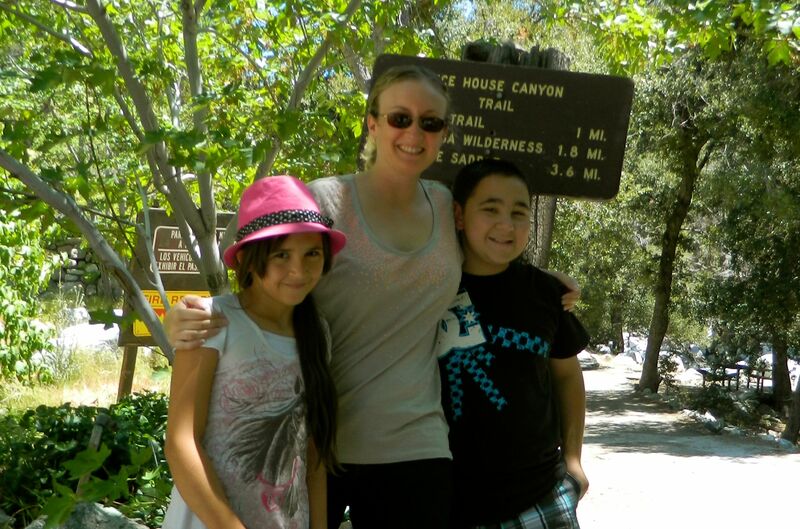 Emily, Hunter, and I at the entrance to Ice house Canyon Trail. The rangers at the nature center are happy to recommend age-appropriate hikes. 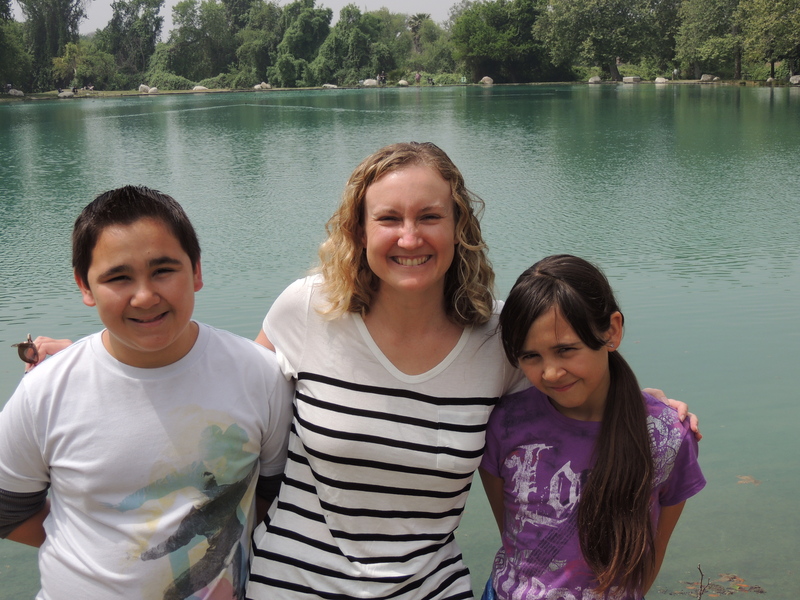 For older kids of Emily and Hunter’s age (tweens & early teens), they recommended the Ice House Canyon Trail, which is really a series of options that you can cater to your kids needs & experience. Rangers recommend that kids be at least 10 years old, although they have seen some as young as 8 tackle it. One recommendation is to simply go along it as far as they can handle and then turn back. When you arrive at the Nature Center to buy your parking pass, the rangers will be happy to give you directions. If you go on a weekend, make sure to arrive at the trailhead early, as parking is limited. 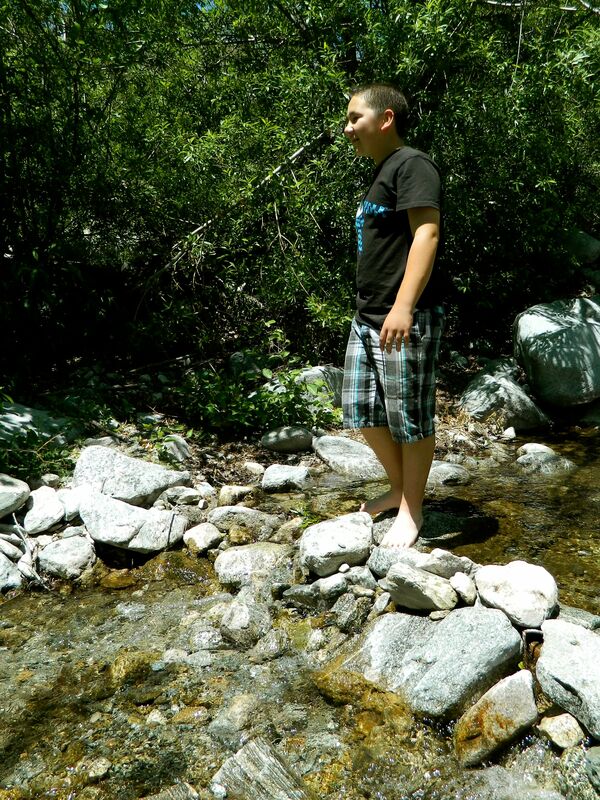 The hike to San Antonio Falls is an easier option for smaller kids. The ranger we spoke to said that she sees people with strollers on it all the time, as it is really more of a paved road than a hiking trail. The trailhead and parking area is near Snowcrest Lodge and the campgrounds of Manker Flats. The distance from the parking area to the falls in 0.6 miles with an elevation gain of 240 feet. The Mt. Baldy Nature Center is a great place for a picnic in the cool shade of pine trees. 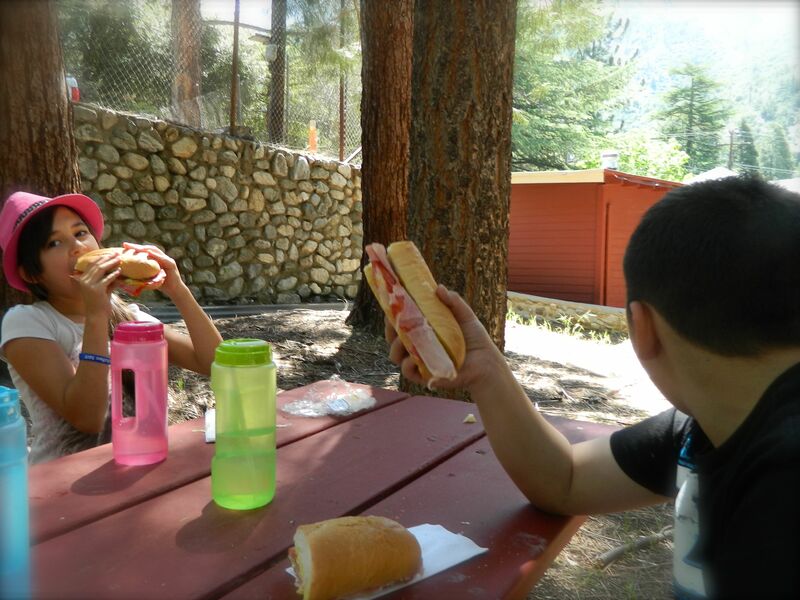 There are picnic areas all over Mount Baldy, and the nature center is a great place to inquire. If you can’t wait though, it is also an excellent place for a picnic. Emily, Hunter, and I ate in under the shade a gorgeous coulter pine while some very bold blue jays begged from nearby trunks. For an easy picnic, stop for sandwiches at Claro’s Italian Market in Upland before heading up the mountain. They have a make-your-own sandwich option that lets you choose three different meats and one cheese. Meats and cheeses are both imported and domestic, from at least four types of turkey to hot capicola, the choices seem endless. For a bit of rustic charm, visit the Mt. Baldy Lodge across the street from the nature center. Built sometime before the 1940s (no one really knows for sure) the little complex boasts a restaurant, bar, pool tables, and even cabins behind. Walk through the restaurant to find a cute patio garden for sunny days. While there is no kids menu, they have a kid-friendly selection and a staff willing to accommodate even the pickiest of eaters. 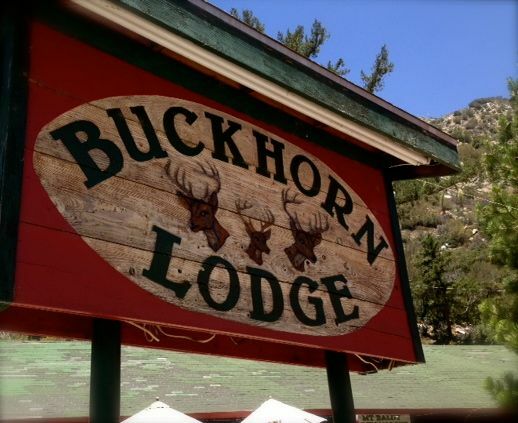 Surrounded by vaulting mountains faces, the Buckhorn Lodge has opened its patio to Summer Outdoor Bar-B-Ques (weather dependent), complete with hamburgers, chicken, and giant hot dogs. Enjoy mountain views and the sound of San Antonio Creek as it passes by the building. From the 210 Freeway, exit mountain Avenue in Upland and head north, toward the mountains. Follow Mountain Avenue as it curves toward the foothills. When you reach a T-intersection at the base of the foothills (with Euclid Avenue) turn left. Continue up the hill, passing a fire station until you reach another T-intersection, this time with Mt. 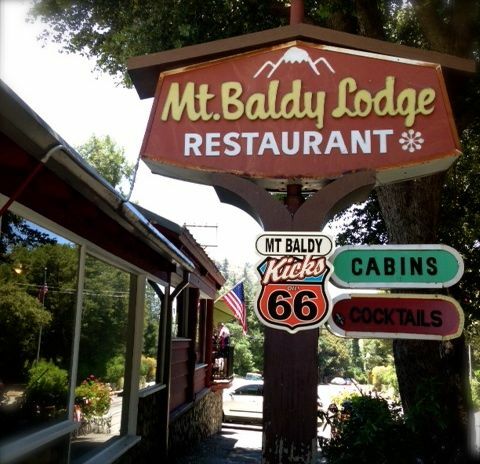 Baldy Road – turn right and drive up the mountain until you reach Baldy Village. The Nature Center will be on you left. Hunter, Emily, and I at a local park. Mt. 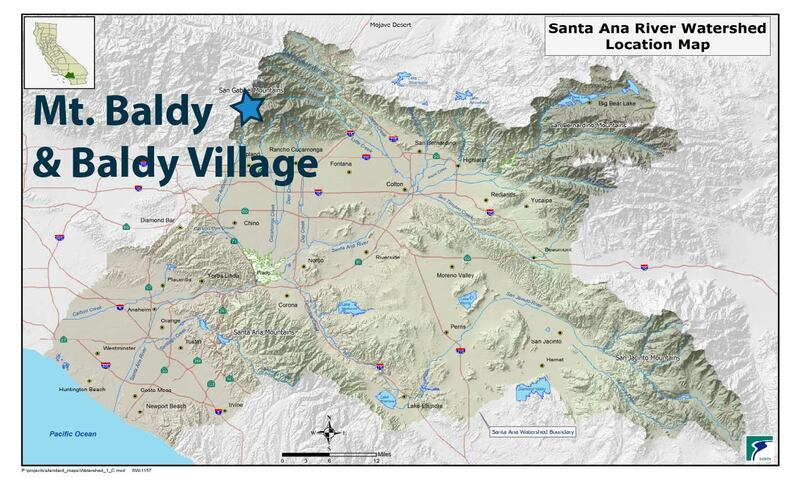 Baldy is part of the headwaters of the Santa Ana Watershed.